Contact ACCESS Secretary Susie Fung (sfung@pps.net, (503) 916-6483) to sign up to attend. The ACCESS application period is now open. Applications can be submitted through April 25. Learn more and apply. Contact Susie Fung at sfung@pps.net or (503) 916-6483 to RSVP and with any questions. Want to connect with a current ACCESS family? Contact access.pta.outreach@gmail.com. ACCESS Applications open today! To apply, check out the Enroll section of our website. Application window closes April 25. We are fortunate to have Pam Joyner as interim Principal and John Blanck as interim Assistant Principal. Ms. Joyner is already serving in this role beginning Friday, 2/1/19. Mr. Blanck will begin Tuesday, 2/5/19. They bring years of experience to the job and are excited about working with your students. We would like to offer you an opportunity to get to know your interim administrators and invite parents and guardians to meet Principal Joyner and Assistant Principal Blanck Tuesday evening at 6:00 in the PPS Board Room at the BESC, 501 N. Dixon St. If you would like to contact either of them, they can be reached at pjoyner@pps.net or jblanck@pps.net. We will begin holding our monthly tours for prospective new families this month. If you would like to be present to share family perspective with those attending, please email Krista for Lane and David for Vestal. If you have already emailed us with interest, please arrive this Friday at Lane at 8:30 to go over content and schedule with David and Krista prior to the first tour. Thank you for your time and dedication to the ACCESS program! David and I are excited to share our work with Young Audiences and our Arts Coordinator, Genevieve Stevens-Johnson, who is in charge of booking amazing opportunities for arts related opportunities for our students. She has been hard at work researching potential author visits, trips, residencies, and enrichment for our students that align with curriculum, access for all students, focus on diversity, and shared events for ES and MS. We are thrilled with what we have on the calendar so far and also for events in the works. I asked Genevieve to share a bit about herself and the work she is engaged in for us. She will also be coming to staff meetings in January at both sites, to get input from staff around class and grade level trips. My passion lies in promoting and finding ways to provide music and arts to the widest possible audience of children, with a particular focus on addressing issues of equity and inclusion. I am excited to work with staff and families to organize arts experiences for the students in the Access program. My goal is to provide experiences across all grade levels, including several opportunities for all students to come together. I've already had a chance to meet with some teachers and staff members, as well as parents, and our work is moving forward beautifully. Please see the list of upcoming booked events and field trips below, and keep an eye out for updates as more events are verified in the coming weeks. Karida Griffith (Performer, Instructor, Choreographer) is a Portland native who has established an extensive dance career in New York. A student of the one and only Sally Mack, Karida’s dance career took off when she was cast in the European tour of the Broadway hit Black and Blue, working with the great Henry LeTang, Dianne Walker, Bunny Briggs, Germaine Goodson, Dormeshia Sumbry-Edwards and others. After completing her business degree at NYU, Karida became a Radio City Rockette, where she performed in the Radio City Christmas Spectacular, Sinatra, on The Today Show and The Tony Awards. Karida was also a dancer for Cirque du Soleil, and was a featured dancer in multiple episodes of the HBO hit series Boardwalk Empire. Currently a member of the critically-acclaimed tap dance company Dorrance Dance, Karida was also honored to be a member of select companies including the Cotton Club Sophisticated Ladies with Dormeshia Sumbry-Edwards, T.A.D.A.H. with Jared Grimes, Mable Lee’s Ladies, Barbara Duffy & Company, and has also performed with Chloe Arnold’s Syncopated Ladies. In addition, Karida was the producer of Creations: Choreographic Introductions, which featured her own choreography along with early works of Dana Foglia, Mishay Petronelli, Chloe Arnold, Michelle Dorrance and Claudia Rahardjanoto. Karida has been on the tap dance faculty at the renowned Broadway Dance Center in New York, and a Professor in Pace University’s cutting-edge BFA Commercial Dance program. She has taught at festivals and conventions throughout North America. Based again in Portland, Karida is the founder of the annual PDX Tap Intensive, is a performing artist for Young Audiences of Oregon, and a member of the West African Dance Company, Sebe Kan. As she has for the past 16 years, Karida continues to work with the The Children’s Theatre Company, a non-profit organization which fosters the belief that, through the arts, children can become agents of positive change and healing in the world. From January through May, we will begin holding monthly tours of both ACCESS@Vestal and ACCESS@Lane. The details are in the Enrollment Section of the website. If any parents or students would like to represent the ACCESS community in the information session and tour, please let me know! Additionally, if 5th grade families of current ACCESS students would like to get more information about the Middle School program and tour the building, the Family Tours are also for you! Please just pick a date and time, RSVP with Jamille, and we will be excited to share any information with you that you are wondering about. David and I set up the "Coffee with David & Krista" dates for the rest of the year. We varied the days, locations, and times up the days and times in response to family requests. We also coincided them with other events that families would already be at, to lessen travel times. Attached are the dates, times, and locations for the remainder of the year. Our next coffee will take place on Monday, December 10th from 5:30-6:30 in the Lane cafeteria. Please feel free to bring any treats/baked goods to share. We will provide coffee and tea! Childcare will be provided for evening Principals' Coffees. We apologize for any confusion over the date for November and want to clarify that there is no admin coffee tomorrow, 11/30. We hope that having all the dates and times in advance will allow for more parents to attend. Please remember if you are changing after school plans to email both Susie Fung and your child’s homeroom teacher. Thank you! ACCESS 8th grade students are assigned--by default--to their neighborhood schools in Synergy. Therefore if you want your student to attend their neighborhood school, no action is required by families. There is one exception to this is- if students live in a dual-assignment area such as the Jefferson boundary, you will need to choose between Jefferson and the dual assignment school, OR you will need to make another one of the available choices listed below. Visit https://www.pps.net/Page/2343 for more information on high school choices. Students also have guaranteed transfer option to Grant High. If families choose this option, you will need to fill out the transfer petition on https://pps.schoolmint.net/. Apply in the lottery to focus option such as Benson. The Lane PE Teacher has been out with an injury and as soon as he returns, we will begin shared PE for 4th and 5th periods. The only reason this can’t happen for 6th grade/3rd period is that ACCESS wanted an earlier start time and we shifted our schedule. The desire of the ACCESS Community to start and end earlier than Lane affected our PE for period 3. This was a decision made by ACCESS and requested by families prior to the start of the school year. Unfortunately all aspects and effects of the schedule shift were not initially obvious and now we know. With our shift, our 3rd period moved to coincide with Lane’s entire student population recess, and the gym is their primary recess location. The PE requirement is for one full quarter of PE for MS students each year. Our goal is 2 with our 3 or 2 week sessions, depending on cohort. Next quarter 6th grade/period 3 will be focused on Health, so gym space is not an issue until 3rd quarter. I am looking at schedule shifting options 3rd quarter to allow for gym use for all grades, all PE focused quarters this year. Next school year, I will look to shifting periods of PE for ACCESS students so that it does not fall during 3rd period/Lane lunch and recess. But again I want to reiterate that this was only due to ACCESS switch of instructional day in response to Community request, not due to any lack of support from Lane administration or collaboration between us. Jeandre Carbone has been nothing short of gracious and open to positive problem solving from day 1! Thank you Jeandre. It was interesting for David and me to learn that there were many students at ACCESS who are not officially identified as TAG, even though they of course meet the criteria for TAG identification. We are working with Linda Smith and the TAG department to streamline this identification and it should not require any action on your part. We’ll keep you updated, but this should simply be a system records procedure on our part. Last weekend, our side entrance window was vandalized by a pellet gun. It was immediately replaced by facilities. It is unfortunate that vandalism occurs, particularly at a school. But I would like to thank our custodian Tim Curtin for fast action in contacting facilities to repair the window within 24 hours. Teachers and students had discussions around cell phone use and policy in our advisory classes, then had student representatives from each class help construct the plan as group. I think it was an incredible process and way for students to take ownership of their own digital citizenry, as well as protected the rights, safety, and comfort of all individuals. The final policy summary is that students can use phones in passing times and at lunch, with an absolute rule being no filming or pictures of anyone else at the school. Phone use in class is determined by the teacher and academic purpose. Each teacher has outlined the policy and posted it in their own classroom. Violations of any teacher, or school policy result in a warning to put the phone away, a second ask would result in the student giving the teacher the phone for the period, and any repeat/concern over a phone issue would proceed to a meeting between teacher, myself, and students to find a solution. Students in 1-8 have been engaging in the MAP (Measure of Academic Progress) testing the last 2 weeks. Testing is MAP/NWEA. It is a PPS internal adaptive growth assessment that is used to see where students are now in Math and Reading and a number of skills within each subject. It allows teachers, parents, and students to see the data, work together to set goals based on their strengths and areas for growth, and support targeted grouping for differentiated instruction. It takes the place of the EasyCBM that has been used in the past. Here is the link for parent information and resources. Teachers will be sharing the data with you as ONE peice of your child’s progress at conferences. It is important to remember that any assessment is one piece in a larger “body of evidence” and the puzzle that encompasses your child as a learner, person, and global citizen. I have worked with this assessment tool since 2006 and love the information, reports, and growth data it provides. It is used extensively at international schools and I’m thrilled that PPS has adopted this assessment tool. Tara Sylvester, our new Special Education teacher at Vestal. She comes to us from Baton Rouge and is dual certified in SPED and Gifted Education. She will be spending her first 2 weeks with us meeting with each family she services, to get to know the students, their IEPs, and their unique needs and talents. David and/or I will be attending many of these meetings as well. Welcome Tara! Corrie Chambers, our new EA at Lane will also be adding FTE from our Foundation Funding to spend time at Vestal each day. She is a local parent and PTA member, who has children in PPS. She will be starting her days at Vestal and will head over to Lane each day to support our lunch and recess. Thank you for taking on this additional role and getting to know and work with students at both ACCESS campuses Corrie! Aurel Coste, our long awaited Math teacher at Lane will be joining us at long last, next Thursday! His priority coming in will be to connect with students and send a survey to families to determine where students are and share with families the curriculum and plan for his courses. Welcome Aurel! We are eager to begin work on our ACCESS Site Council. The focus of this work will be to look at instructional practice, curriculum, and enrichment opportunities at our school. If you are interested in being a part of this important work this year, please email me (kblovad@pps.net). Dates and times will be determined by those who become part of the council. Jeandre Carbone and Krista Blovad are working to plan for possible shared class offerings second semester. These may include foreign language and music. We will keep you updated, but wanted to let you know of our work and plans. We have new Special Education staff starting at Vestal and will send out a separate email to parents of students to update you on personnel and your child's services. I am delighted to be able to continue as the Interim Principal here for as long as I am needed. I have a desk at the Access at Lane site; if you want to contact me, or any of the staff, the Access webpage has current information on the names, phone numbers, and emails for all the Access staff at both sites, shown at https://www.pps.net/domain/3787 . No School Monday in PPS - this is a Planning Day for teachers to work on report cards, grades, and plans for the last quarter of the year. Outdoor School: Our 6th graders leave on Sunday for their Outdoor School experience, and will return Friday afternoon. If your child is goibng to Outdoor School, please remember to send an medicines or medical information with them, as detailed by Eric Lannes. Parent Support: I am so impressed by the responsiveness of the parent community, as well as your expertise, commitment, and generosity. Whether its in your donations in the Auction, hosting fund-raisers, coordinating movie nights and supporting talent shows and school dances, or the thoughtful provision of teacher lunches (and chair massages for the staff this coming planning days), it is truly humbling to experience. Your PTA, Foundation, and individual offers are so very appreciated. Thanks to all of you that participated in the Successful Schools Survey. The district wide goal for family participation was 50%, we exceeded that number with 63% of our families taking the survey. I also appreciate those of you that have been waiting patiently for us to confirm the date for 8th grade promotion. It will be June 5th at Franklin High School. There will be more details in the coming weeks. I know many of you have been concerned and had questions about our staffing numbers for next year and the impact of the 17 million dollar district shortfall on our program. Like many schools in the district we are facing a cut. The good news is that our initial cut has been significantly reduced down to -.40 FTE. We are going to use Foundation funds to offset this reduction in FTE in order to keep our current staffing in place. Elementary teaching staff kept in tact pending closure of the lottery. We will need 20+ new 4th and 5th graders to be staffed for 7 teachers. If we fall short, we would be facing a cut of one FTE and need to create three sections of 4/5 blends. Middle school staff kept in tact as long as Foundation keeps pace with their 3-year historical fundraising numbers. We are planning to pay for a .35 FTE to keep staffing the same and class sizes small. .35 FTE towards a teacher in order to keep middle school classes small, allow for current differentiated math levels, and keep current elective program in place. While I consider all of this very good news, our work is cut out for us to attract additional students in 4th and 5th grade, as well as raise lots of money at the auction for our FTE needs. We want to keep this program stable and growing! We have been very busy both with the day to day, but also with an eye towards what is coming up. We also want to express our gratitude to all those who are supporting staff and students. The PTA potluck for staff was a recent example of the kindness of this community, and I know that we are all deeply appreciative. Principal’s Coffee - Friday, February 22, 8:45 to 9:45 in the Vestal Library. We will provide some coffee and hot water/tea that morning, just prior to the Parent Tour. You are welcome to join both administrators for this informal get-together. School Tour - Friday, February 22, 10:00 – 11:00. This tour is offered to parents who are interested in finding our more about ACCESS, including how to apply and the offerings here. It will be hosted by both administrators along with Brigid O’Hagan, (our amazing teacher), Linda Smith, (Director of TAG), and current parents. If you are a parent that is willing to come and help answer questions about the program, please let us know. Movie Night - Friday, February 22, at Vestal. Pre-events start at 6:30 and the movie starts 7:00. Inside Recess at Vestal – We’ve had to have inside recess after lunch several times in the last few weeks. Students get the choice of either going to read in the library, going to the “studio” to play board games, or going to the auditorium to watch a video (Planet Earth episodes on “Mountains” and “Cities”, with notable hit performances by golden eagles, grizzly bears, and swifts). Successful Schools Survey – Please take time to complete this PPS survey that will give school leaders an opportunity to hear your voice. The window to take the survey is open until March 1st. Communication - John discovered that his district Outlook account has been deciding to send some of his incoming emails to the “Junk” folder (its happening to other principals too). He has been looking through that folder, and so far only found one related to ACCESS (the email with feedback on the Read a Thon). He wants to apologize if any of you have had other emails that weren’t returned; PPS IT department has been working on this and we think it is fixed. Battle of the Books competition and Talent Show rehearsals are under way, stay tuned for upcoming details and updates. Interim Staff - With several interims stepping into roles right now, we want to make communication lines are open. I have enjoyed meeting many of you since officially becoming the interim principal on February 1st. I want to thank you for all the support and encouragement that I have received already. For those who were not able to attend the meet and greet on Wednesday night, I would like to give you a brief introduction to my background. I have been in PPS for many years as a teacher (Madison HS and Grant HS) and administrator and have considerable knowledge of how the district operates. I am also a parent, with three adult children who went all the way through PPS schools, so I bring that perspective as well. Retired as the principal of Metropolitan Learning Center K-12 Alternative School Retired is a relative term, since officially “retiring” a year and a half ago, I have been working as a mentor to six new administrators (who are in their 1st or 2nd year as leaders) while also subbing in buildings as my schedule allows it. In the past few weeks (before admin went on leave) I have had the opportunity to sub at both ACCESS sites. I have been impressed with the professionalism and resilience of the staff. They are very student-focused and many have leaned-in to help in ways that have allowed me to get on board quickly and understand the needs of the school. I will be serving as the interim principal ACCESS for the month of February, my goal is to lead and manage the school while the Krista is on leave. This will include being responsive to the day to day needs of staff, students, and families. Ensuring that there is clear communication along the way. I consider myself someone who listens to lead. I will also make sure that priorities such as teacher evaluations, professional development for teachers, and Open Houses are effectively scheduled and completed on deadline. I will also be looking ahead at the calendar to make sure that events such as the talent show, auction, and 8th grade promotion are on track for Krista’s return. On a side note, I very much enjoyed the poetry slam that I attended this week. I also want to say that I feel very comfortable working with John Blanck who is the interim assistant principal. I believe he has the right expertise and temperament to be the acting admin at the Vestal site. Area Assistant Superintendent Keeley Simpson and TAG director Linda Smith (who I met with last week) have also been tremendously helpful. Finally, I can’t say enough about the parent community, you all are amazing. Thanks to those of you who came today to help with our Open House and for the lunch provided for staff at both sites. I admire your generosity and passion for the ACCESS learning community. Hello to the Access at Vestal parents and community! My name is John Blanck, and I am happy to be the Interim Assistant Principal here during the leave for David Jamieson. During my first two and a half days here, I have been trying to jump in immediately to be of help to the staff and students. I have also been looking at ways to get you as much information and communication as possible. I really appreciate the patience and understanding that you have shown me in my brief time here. · My background related to ACCESS: I have 4 adult children, and two of them attended a program very similar to ACCESS while in elementary grades in Illinois. I remember well my nervousness and the advocacy I needed to get them into that program (for example, in spite of my years experience as a School Psychologist in that district, and my usual calm demeanor, I’ll never forget my impatience in the eligibility meeting for my first daughter, waiting to hear them agree that she should be eligible for that TAG program and placement!). It was a wonderful experience for my kids. I have worked as a School Psychologist in public schools for 24 year (including about 7 years assigned to that TAG program my daughters had attended). I then went directly into Elementary Principalship at Maplewood Elementary near Multnomah Village in 2000, and stayed there 11 years. I retired as a Principal, but have continued in part time work supporting the Principal hiring process for PPS which included my facilitation of the meetings held to hear what the community wanted in their next Principal. I conducted those meetings at Sabin and at Rose City Park when there was administrative changes there for Access. (I remember those meetings well and what people were asking for, and remember thinking to myself that I’d love to be an administrator for Access.) I have been mentoring new administrators for PPS schools for the last 4 years, as well. When I was asked very recently to take on this interim role here, I did commit to continuing my work as a mentor, but making those appointments with them happen after school hours as much as I can. · My time here at Access: I don’t have any information about how long Mr. Jamieson will be out, but I sure sympathize with the need for continuity, so I made the commitment to be here full time, as long as needed. So far, I am trying to address the immediate needs of the students, and the staff, to keep things working smoothly, and happily. I am confident in, and enjoy, helping in this way. I also want to assure you that I have great respect for you, the parent community, and always like to help facilitate your generous offers of time and help, which are very appreciated and welcome. · Communication and Emails – I will be working to give you as much information as efficiently as possible. To those who have emailed me about upcoming events, etc., I want to thank you for your patience. I want to get to the immediate concerns first. In my career tried to reply as quickly as possible, but I know that I just haven’t gotten to some of the longer-range issues as yet. Regrettably, I know there is a backlog, but I promise you I am working on it as quickly as I can. I am also working closely with the Interim Principal, Pam Joyner, who I know well and respect immensely, to try to keep things working smoothly. I believe in healthy communication, which includes the concepts of assumption of positive intent, transparency, and integrity. · As I write this on my third day, I also know that the forecast makes us anticipate the possibility of another snow day, possibly on Monday. Please watch for messages from PPS and the media for information about that. Welcome to the 2018-19 school year families and students! It is our absolute pleasure to welcome everyone to the start of what we deeply believe will be an incredible school year for us all. We know it is a year of significant change and apprehension as to the future of the program and school. We understand many of the complexities and emotions involved, due to so many of you reaching out to us and sharing your experiences. We also know that the driving force behind everything is the success and growth of the children who attend and depend on ACCESS to serve their unique talents and learning pathways. Individualized education that accounts for who each student is, what they are passionate about, where they come from, and who they want to be- is what we want to be a part of together. We are co-located in 2 spaces, but often barriers provide opportunities for us to overcome them and become even stronger in spite of them. We also have a unique opportunity to grow skills around collaboration and learn from communities that are new and may be very different from us. My hope is that we find those things that unite us are as strong as those that define us individually. Knowing that there will be challenges has us embracing the belief that the only way we will address them is together, which includes student involvement and input. That is how David and I have been diving into it all, along with everyone else we have been working with since we came on board. We ask you to adopt this “Let’s do this”, mindset alongside us and the ACCESS staff. We know and honor that there is a special history and culture that comes with you. Most of all, we want work with you to make the ACCESS Community even stronger as it moves forward. Thank you for allowing us into your community. It is truly an honor! Hello ACCESS families of 1st through 5th graders and welcome to the Vestal Campus! We are excited to have you join us at our amazing school. David Jamieson has been named the Assistant Principal for ACCESS. He will have an office here at Vestal. Many of you got a letter from me in May sharing some of what we knew then about our co-locating plans. David and I have spent some time meeting and we are able to share more of what we now know. Our intention is to share another letter in August. Once the school year begins, our intent is for David to share a weekly newsletter with ACCESS families and I will send a weekly newsletter to Vestal families. ACCESS and Vestal will have different start/end times to allow for a smoother entry and exit. We are working with transportation on our bus/car drop off/pick-up plan. The specific details will be shared in August. It seems hopeful that the buses will NOT be on the playground. ACCESS and Vestal students will wait outside until the doors open and students are greeted by staff. Please note- there is not an outdoor covered area for waiting in the morning. There are not staff available to be supervising students before school. ALL school doors remain locked during the school day. The door facing Everett has a buzzer for families (for both ACCESS and Vestal) to be let in during the school day. Vestal office in on the main floor. ACCESS at Vestal will have a separate office, on the 2nd floor. All safety drills (Fire, Lock down, Earthquake, etc.) will happen for both ACCESS and Vestal at the same times. David and I will work together on safety/emergency planning and drills. We will teach and practice all drills with all students. We will share details in the Fall. New information regarding the library/media teacher- we will share one library teacher, Ms. Melody Lang. She will be .50 Vestal and .50 ACCESS. The ACCESS library books are being integrated into the Vestal Library. Ms. Lang is working closely with head of the district library, Susan Stone. ACCESS and Vestal specialists will be Library/Media, PE, Art. We are moving forward with hiring a .60 Drama teacher. Details on scheduling to follow! ACCESS students will be notified of homeroom teacher in August. Recess and lunch times will be the same for both Vestal and ACCESS. We are currently working on our supervision schedules, which includes indoor recess procedures. All students will be taught recess/lunch procedures during the first week of school. ACCESS at Vestal will have a student handbook/calendar that will go home with every student on the first day of school. ACCESS at Vestal will be implementing the district EBBL (Equity Based Balanced Literacy) Writing Curriculum, Units of Study, in the Fall. Vestal hosts weekly KICKBALL games every Wednesday during the summer on our playground, 6:30-7:30...please join us. No kickball on July 4th! Community Clean Up day for both Vestal and ACCESS at Vestal is Aug. 18th, 9am-12pm. Please join us in sprucing up our campus! This is a lot of information and I know it doesn’t answer all of your questions, but again our plan is to share another similar letter in August. We hope everyone is having a fun summer! Know that we are working together to make the Fall welcoming and enjoyable! I hope that this finds you enjoying your summer. I have been busy working hard with the district and the principals of Vestal and Lane on the transition of ACCESS to our new school campuses. More staffing information will be shared as it gets finalized, but I am happy to announce that Mr. David Jamieson will be the new Assistant Principal of ACCESS. He will have an office at the Vestal campus. Mr. Jamieson joins the ACCESS community having served as an Assistant Principal at both Beach K5 and Ockley Green. During that time he has enjoyed the opportunity to learn from many mentors, lead a co-located Spanish DLI school, open a middle school and get to know the people in PPS who serve as resources to school leaders. Before moving to Portland, Mr. Jamieson served as an administrator at a high-performing charter school in Los Angeles. While there he saw a 100% graduation rate for all students as well as the development of a school and instructional culture of acceleration, differentiation, creativity, and critical thinking. Born in Portland and an Oregon native, his love of travel and diverse culture began as a child while his father volunteered as a doctor in the Philippines and Hawaii. Traveling throughout Central America and living in Costa Rica while studying Spanish in college shaped his early career path which lead him to pursue his Teaching Certificate at San Diego State University. He then obtained a Masters of Education Teaching English as a Second Language as well as a Masters of Education in Leadership. Mr. Jamieson’s career experience spans sixteen years of working in private, public and charter schools at the elementary, middle and high school levels. He also has international teaching experience at an IB school in Xiamen, China. In his free time, he enjoys snowboarding, fly fishing, surfing, reading and spending time with his wife Sara, their son R.E and daughter Finley. Mr. Jamieson looks forward to getting to know the ACCESS community and being part of the school’s next chapter. Please join me in welcoming Mr. Jamieson. Hello ACCESS families of 1st through 5th graders and welcome to the Vestal Campus! We are excited to have you join us at our amazing school. Vestal is one of the most ethnically and linguistically diverse schools in the city. We have about 68% of our students receiving free or reduced price lunch, which qualifies us as a Title 1 school. We have some unique programs due to our Title status. We also made the community wide decision to be a school that explicitly focuses on social justice starting in the Fall. My name is Sabrina Flamoe and I am just wrapping up my first year as principal of this wonderfully diverse and beautiful school. Previous to Vestal, I was the principal at Laurelhurst K-8, right down the street, and previous to Laurelhurst I was a teacher of grades 3rd through 8th, then an instructional coach. ACCESS grades 1-5 will be co-located at Vestal; classrooms and the office will be in one wing. The ACCESS counselor and Learning Center will be in a different wing, but all on the 2nd floor. Vestal and ACCESS will share a .6 DRAMA teacher which will be housed in our gorgeous auditorium. ACCESS will have its own Assistant Principal, which will be the consistent administrator on campus. The ACCESS principal will be housed at Lane. Vestal and ACCESS will each have their own Art and Media Specialist teachers, but both will be teaching in the Art room and in the Library. Vestal and ACCESS will each have their own PE teachers. ACCESS students will have PE in the Playcourt 2/week and in the gym 1/week…and hopefully outside lots! Vestal and ACCESS PTA’s have begun working together to schedule both evening and school day events that can be shared by all! Vestal is hopeful that our focus on Social Justice and ACCESS focus on Service Learning can be an area of common ground and shared learning. Vestal PTA hosts weekly KICKBALL games every Wednesday during the summer on our playground, 6:30-7:30. Please join us! There will be staggered start time for Vestal and ACCESS in the Fall. PPS transportation dept. is working on logistics and will be communicating with families once decisions are made about transportation. Transportation decisions are not made by building administrators. While we can all agree co-locating comes with challenges, please know we believe we can do this well, even knowing there will be challenges! We invite you to join us in positive problem solving and assuming positive intent that this can be beneficial to all of our students, families, and staff! If you have ACCESS specific questions, please contact ACCESS administration. If you’d like to connect with Vestal’s PTA, please contact our PTA president Galen Gamble at galenblairg@gmail.com. The final five days of the school year are here! How did we get to the end of the year so quickly? Next week will fly by! On Wednesday we learned about our co-location sites and now the work of transitioning and preparing for the 2018-19 school year begins, as we also try to close out this year and finish strong. There is a lot to do and so I will be out of the building for some meetings next week to plan with the principals and the district for next school year. As I mentioned in this morning’s Principal’s Coffee, we have been on a wild roller coaster ride this year and I want to thank you all for staying on this ride with us. As our learning community expands onto two campuses and includes two other communities, we will be working on ways to help everyone with this transition. Our staff is still evolving as the year comes to a close. I have already shared the changes that we have so far in previous communications, but there is one more change that has come about in the last week. We also still have a few vacancies which we hope to fill by the end of June. Being principal for the day was a lot of fun. It includes lots of learnings about being a principal today with Ms. Nguyen-Johnson. It was really fun being able to be in her office, walk around the school and eat in the teacher’s lounge. A principal's job takes a lot of responsibility. It is to take care of a lot of things and a lot of people. They help with activities, paperwork, meetings, answering questions, talking to people. A principal has their own office and is very busy. Any remaining account balances (positive or negative) on students’ meal accounts at the end of the year will be automatically held for students at their current school or transferred to students’ new schools within the district. If your student is leaving the district, then you may call Robin Cafeteria Lead at Access and BC@RCP to arrange for a refund. Donations are also accepted for helping cover owed money on student meal accounts. Visit our department webpage www.pps.net/nutrition to make a donation. All Lost and Found items are on display at the main entrance of school until the end of the day on Monday, June 11th. Please take a look for any items you may be missing. All unclaimed items will be promptly donated to the PPS Clothes Closet the following morning. There will be an 8th grade potluck picnic at Rose City Park (the actual Park at NE 62nd Ave and Tillamook- we will set up on the 62nd side around the picnic tables) directly following the 8th Grade promotion ceremony on Friday, June 8th. 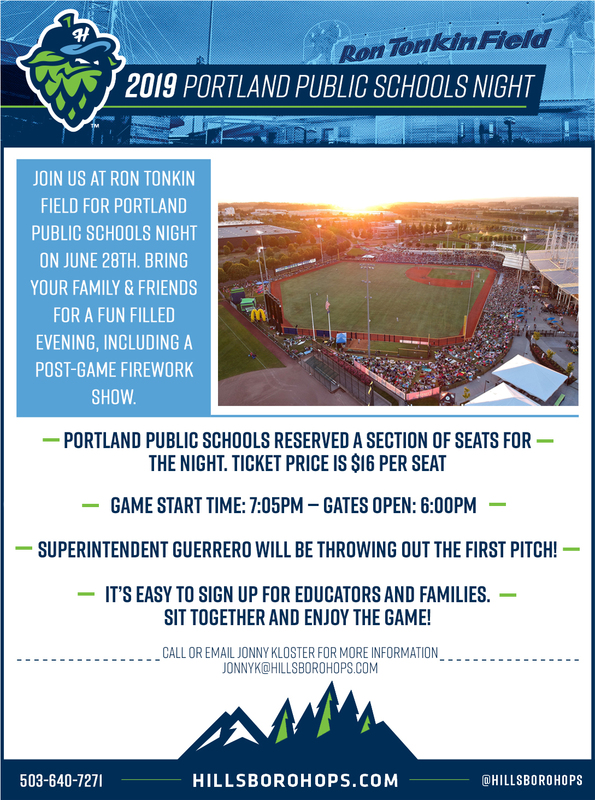 This is not a school sponsored event, so students will need to be signed out by a parent or guardian at the office before leaving (or have a note from home with permission to leave school and go to the park). Students can return to school to catch their bus. We will provide meat and cheese deli trays, bread, and fixings for sandwiches as well as a vegetarian option. Signup genius link is https://www.signupgenius.com/go/20f0d4aafaf2cabfb6-8thgrade. It includes spots to sign up to contribute $ toward party trays as well as set up and clean up. Hope you can come help celebrate the last day of eighth grade! This week also flew by! We have four weeks of school left. The last day of school for 2017-18 remains June 8 - please see the message from the district that was shared with the PPS community earlier this week. A huge thank you to the PTA and the families of ACCESS Academy for making the staff feel appreciated during Staff Appreciation Week this week! We were well fed, ready to go with morning beverages, and showered in notes and flowers. We also thank you all for the generous gift cards. Also, we still anxiously await a decision on our location(s) for next school year. It is hard to believe that May is already here...the time has been flying by! The Bike Fairy will be visiting the Rose City Park Campus on Wednesday, May 9 and leave a small surprise on all the bikes parked on campus.